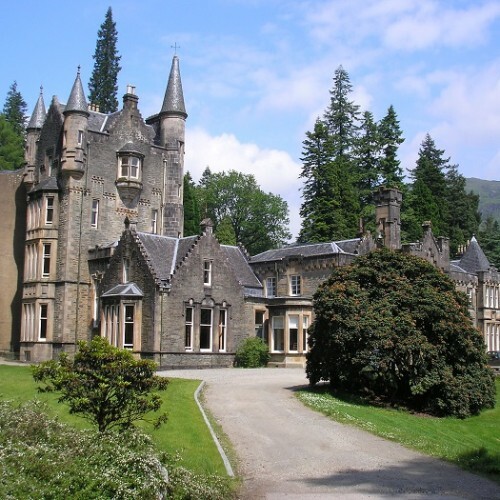 A choice of two lovely Highland Country Holiday cottages in the heart of the Cowal Argyll countryside surrounded by Wildlife, Nature and beautiful hills. 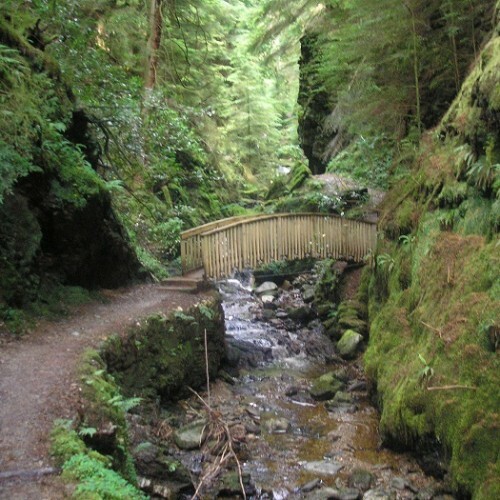 There is a wide variety of cycling or walking in this area. 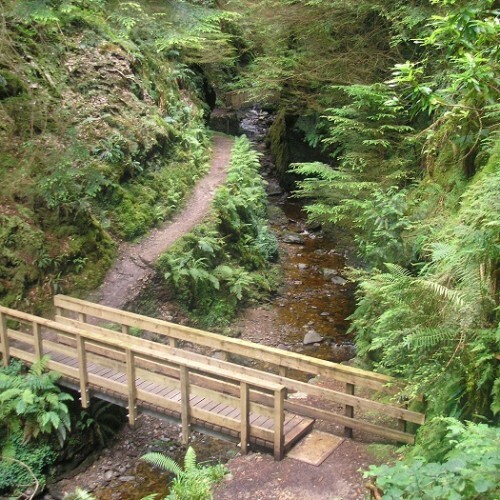 The cottages are located on one of the loop walks off the Cowal Way and can provide transport for drop-off or pick-up for walking stretches of the Way. 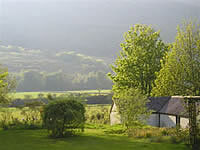 In this locality there is also a Inn / Pub the local Glendaruel Hotel serving good food and drink. This is a rural glen and the surrounding fields may contain cattle and sheep, sometimes with young and there are midge control machines in operation to assist in your comfort. 2 Cottages, Sleeps 4, Traditional semi Detached, Remote Countryside Location, Washing Machine, Bedding and Towels, Fridge / Freezer, Sat TV / DVD, Electric Heating, Dishwasher, Midge Control, Gardens, Gas BBQ, No Smoking, Pub / Inn 3 miles away. If you enjoy beautiful scenery, seabirds, seals and boats and if you love the tranquility – without the long trek to the North West of Scotland, Kames is perfect for your needs. 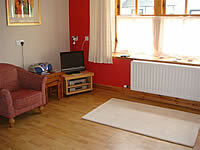 Set directly by the Shores of the UK’s very picturesque “Kyles of Bute” and commanding panoramic sea views. 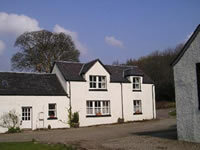 Holiday Takers are welcome to bring their own boat and moor it close by..to trip up or down the Kyles. Tighnabruaich abounds in wildlife. Seagulls, Cormorants, Gannets, Eider Ducks and Swans are frequent passers-by. During the long summer evenings the holiday taker often enjoys the company of a Seal or two, curious to see what is going on. Combine these spectacular views of the Isle of Bute…with a trip to the captivating Isle of Bute a beautiful little island about 15 miles long and nearly 5 miles wide and within 20 minutes of Hill Cottage, always a favorite day trip with much to offer with hills in the North and plenty of sandy beaches, ruined chapels and castles, yachting, fishing, golf, etc. 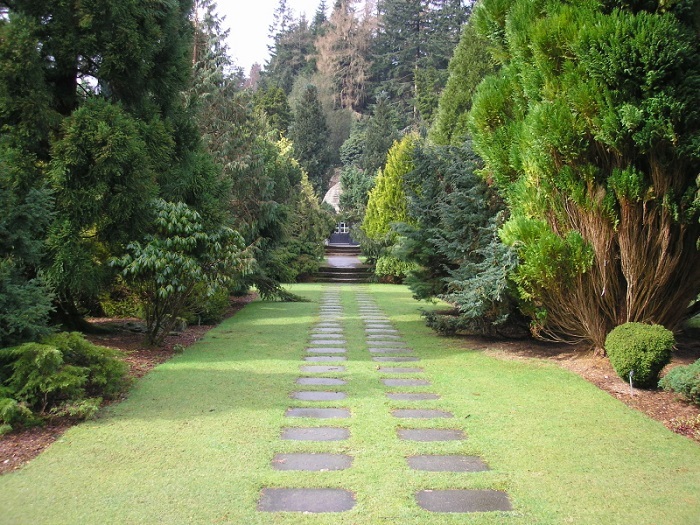 Bute’s many gardens benefit from the Gulf Stream which gives the island a mild climate enabling palm trees and other exotic plants to grow here. 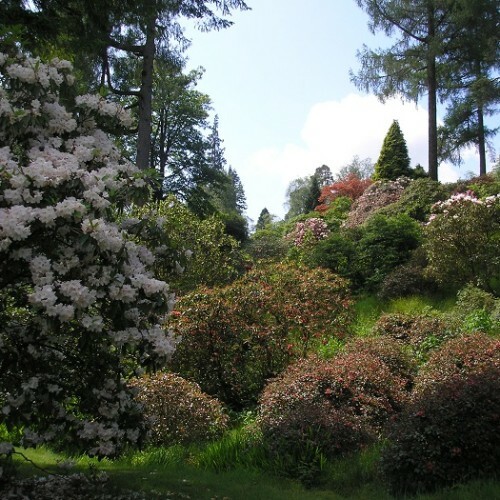 One of the main visitor attractions is the spectacular Mount Stuart house and gardens. Canada hill offers the best views from this island. 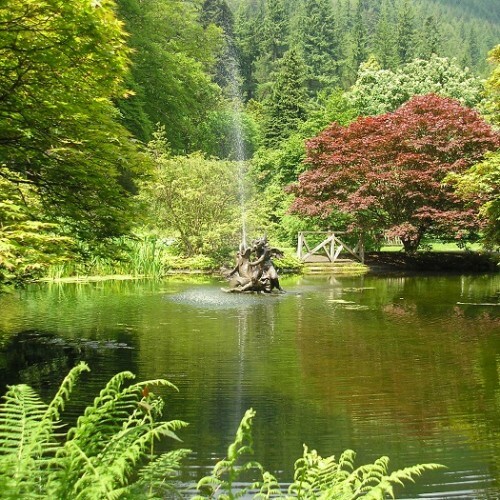 Within a most scenic 30 minutes drive lie The world famous Benmore Gardens, a specialist garden of the Royal Botanic Garden Edinburgh, is a magnificent woodland garden set amidst the mountains of the Cowal Peninsula. 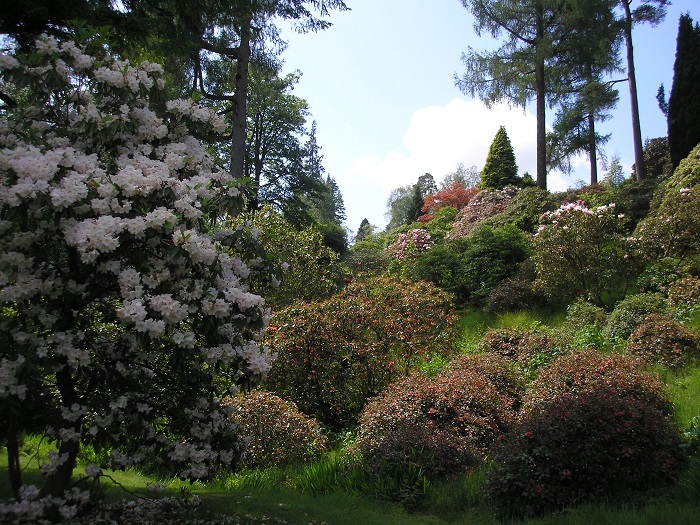 Its 140 acres are renowned for the wide collection of trees and shrubs, which includes over 250 species of rhododendrons. 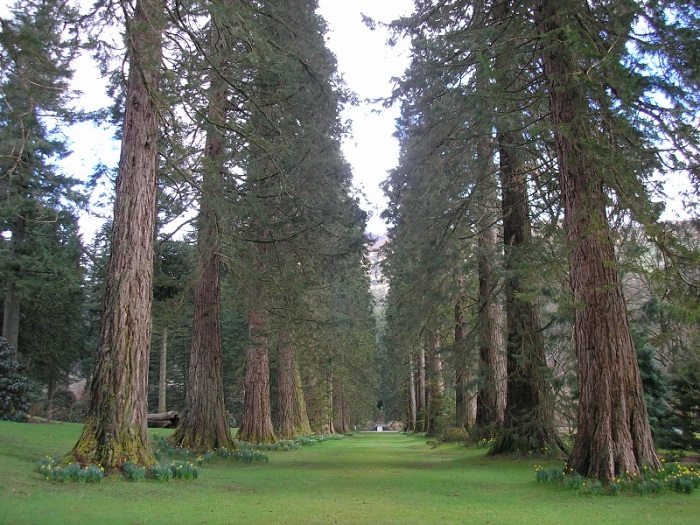 One of the most spectacular views is the avenue of Giant Redwood trees (pictured below) which greets every visitor on entering the garden. 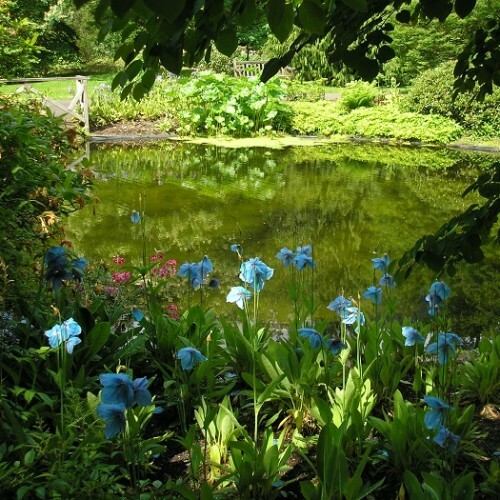 Throughout there are way marked walks, which lead to a beautiful pond and formal garden which display a wide variety of Himalayan and Oriental plants. 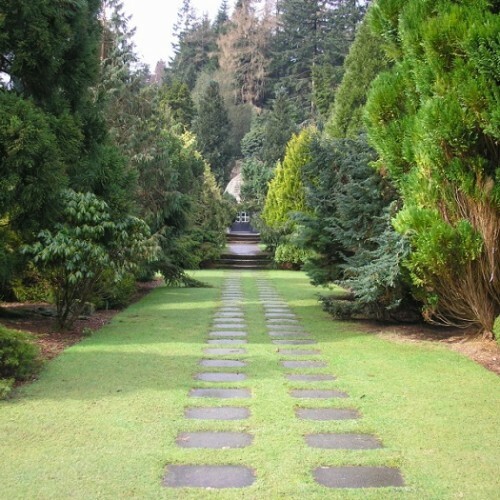 Continue up the richly planted hill slopes, which rise to 450 feet to a dramatic viewpoint overlooking the Eachaig valley and the Holy Loch. Refreshments are available. 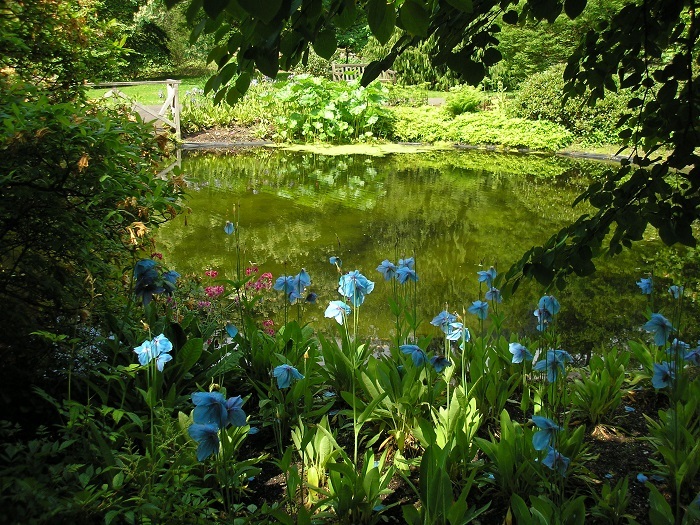 The Botanics Shop sells a range of books, gifts and plants some of which can be found in the garden. Facilities are also provided for those less able, including wheelchairs. 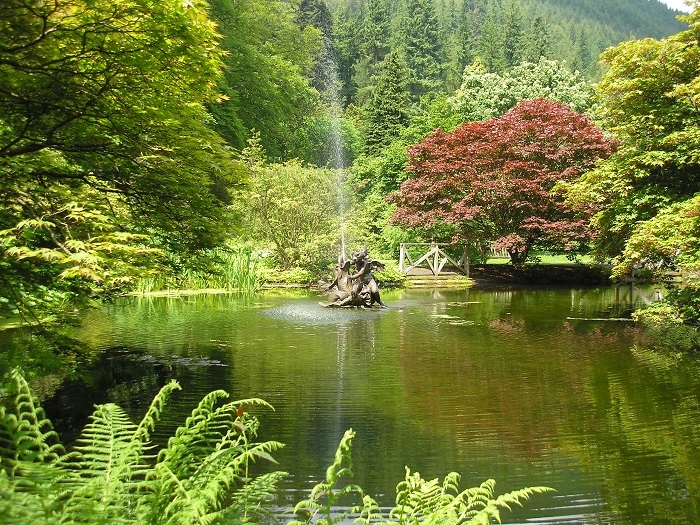 While visiting the Benmore gardens it is well worth visiting Pucks Glen and a choice of 3 mouth watering woodland trails all Pet Friendly and sign posted and marked out. Offering a sometimes tropical rainforest feel with magnificent views from the summits. 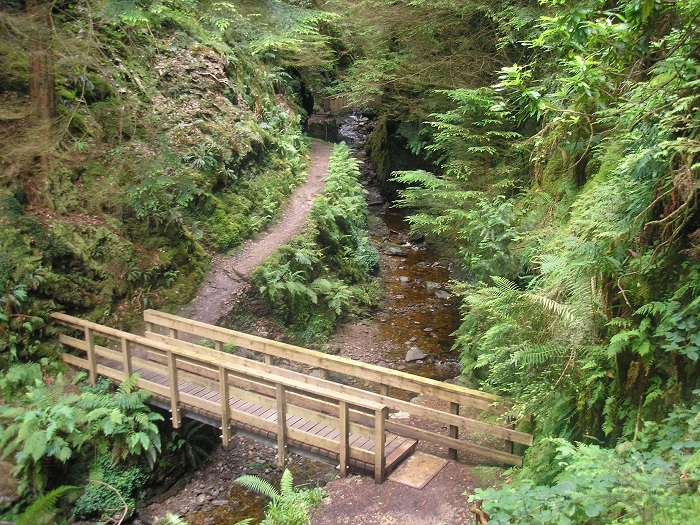 The waterfalls walk (below) features a meandering tour up the valley involving a series bridges crossing streams, cascading waterfalls and pools, particularly delightful after a strong downpour of rain ! 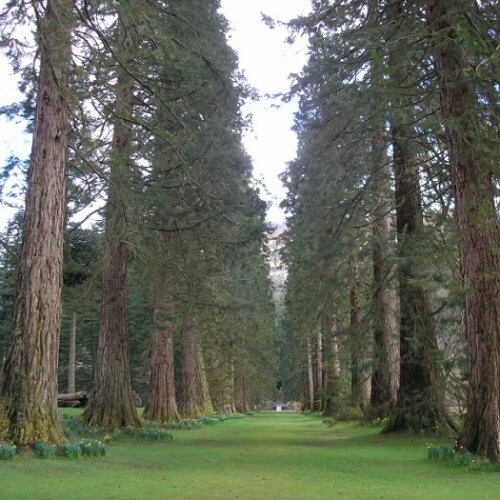 Well worth a visit during your stay and less than 60 minutes drive is the lovely town of Inveraray (Inbhir Aora in Gaelic) a former royal burgh in Argyll and Bute, located on the western shore of Loch Fyne near its head. One time traditional county town of Argyll and ancestral home to the Duke of Argyll, who founded the town in 1745, alongside his new home, Inveraray Castle. Its distinctive white buildings on the loch shore make it very photogenic and it is a very popular tourist destination, with a number of attractions in addition to the castle. The Georgian Inveraray Jail in the burgh is now a museum. 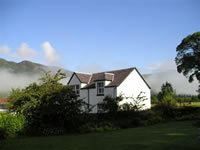 Other attractions include the Argyll Folk Museum at Auchindrain. The Celtic Inveraray Cross can also been seen in the town. The Arctic Penguin ship Maritime Museum is moored at the pier, along with the Clyde puffer VIC 72, renamed Eilean Eisdeal. 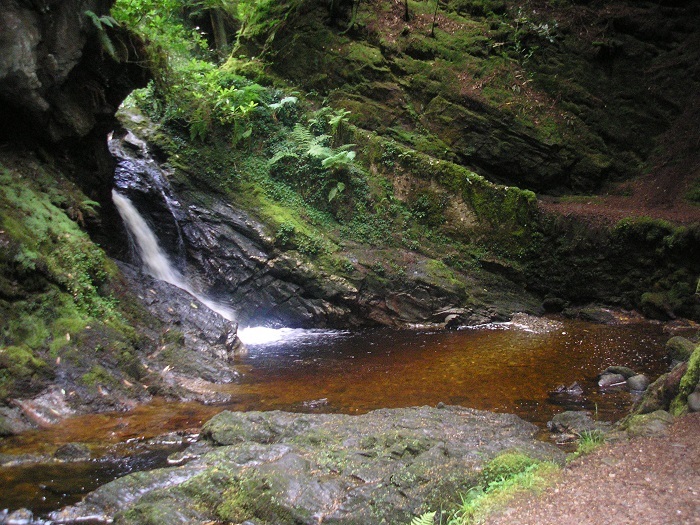 The valley of Glendaruel is thought to be one of the valleys praised in The Lament of Deirdre, a Gaelic poem dating back to at least 1238, in which reference is made to a “Glenndaruadh”. Deirdre is a tragic heroine in Irish mythology, and in the poem she is lamenting the necessity of leaving Scotland to return to Ireland. 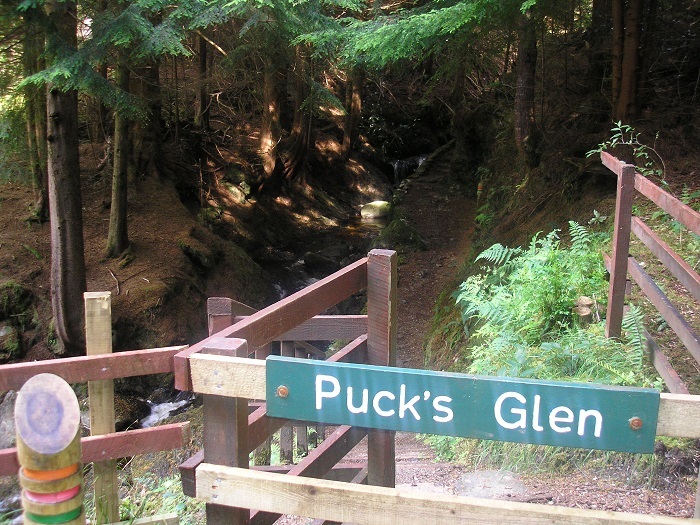 The main village in Glendaruel is the Clachan of Glendaruel. The Scottish mathematician Colin Maclaurin was born here in 1698 to the Reverend John Maclaurin, who was minister to the parish of Kilmodan. The present Kilmodan Church was built in the Clachan of Glendaruel in 1610. 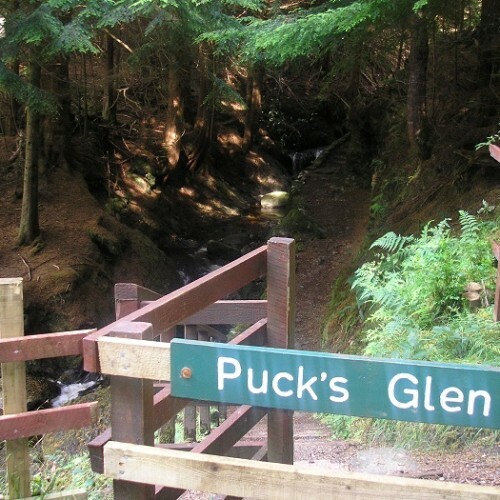 The Clachan of Glendaruel is the current location of Kilmodan Primary School, and the ground of Col-Glen Shinty Club. 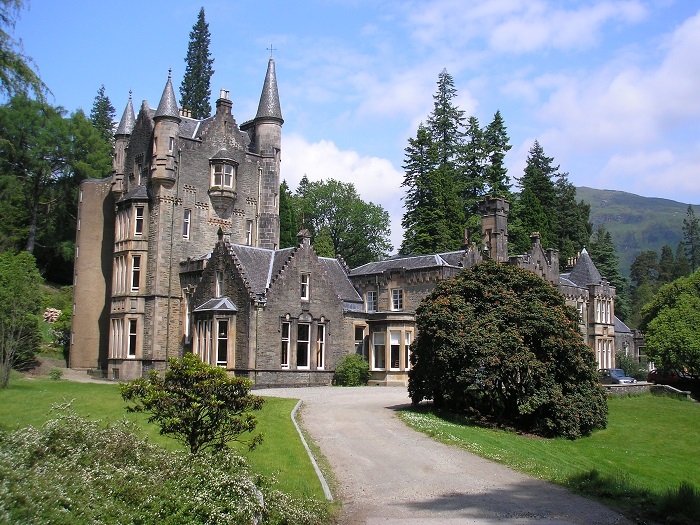 Dunans Castle is also to be found in Glendaruel, while Glendaruel Wood and Crags and the Ruel Estuary are both included in the List of Sites of Special Scientific Interest in Mid Argyll and Cowal. 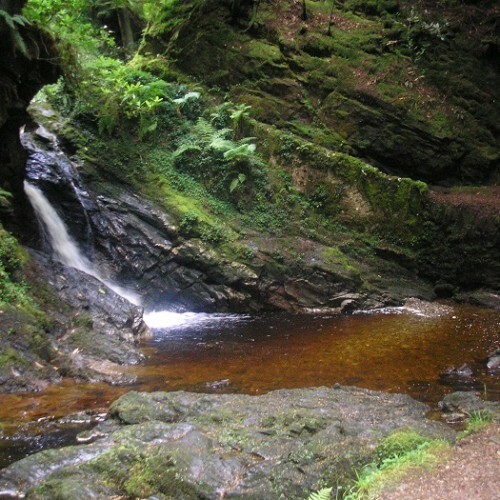 Glendaruel is the inspiration for a number of bagpipe tunes, including The Glendaruel Highlanders, and The Sweet Maid of Glendaruel. A short drive away lies Tighnabruaich by the Shores of the Kyles of Bute in Argyll and Bute, Scotland. Tighnabruaich is popular for sailing and yachting and has its own sailing school but shinty is the major sport with the village being home to Kyles Athletic who have won more Camanachd Cups than any other team apart from Newtonmore and Kingussie. 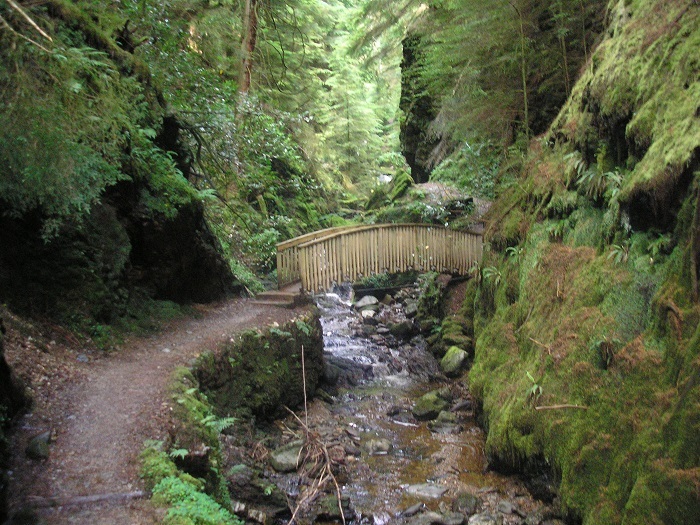 There are a number of cycle routes posted for the area as well as signed walking routes. 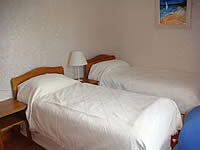 Accommodation can be found at various hotels and guest houses. Tighnabruaich has a Spar shop for your groceries and wines etc, a gift shop, art gallery, post office and a couple of coffee shops. village centre of Tighnabruaich which has a village shop, doctor’s surgery, bank, hotels, restaurants, sailing club, sailing school, and arts and craft gallery. There are many local handicrafts being made in the village with a number of craft fairs being organised each year. 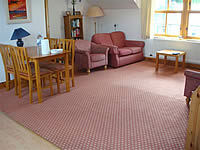 Close by is The Glendaruel Hotel located at the Clachan of Glendaruel, PA22 3AA Tel 01369 820274. This is a Traditional Hotel With a Lovely a contemporary feel and a Lively Bar and a Popular Restaurant. Eating out The An Lochan Tel: 01700 811239 offers top quality local fish, meat and game to guests wanting to sample the best of West Coast produce. There is also the Kames Hotel Tel 01700 811489 serving excellent food using local produce – freshly caught fish and shellfish, as well as fine Scotch beef and wild venison. This Edwardian hotel has a restaurant overlooking the water and its bar offers real ales, good malts and local history with their extensive collection of Edwardian and Victorian photographs. Both properties have ample parking, central heating, double glazing indoor and outdoor games, garden furniture, gas barbecue and garden. 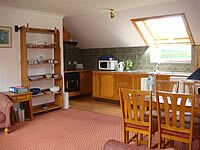 The Stables accommodation consists of an open plan lounge with kitchen and dining area with TV Video, CD Player. Double bedroom after a long day stretch out and relax, enjoy the peace and quiet, this bedroom has ample hanging and drawer space and fantastic views of the Glen. 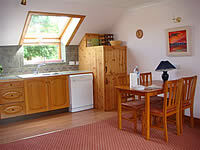 The twin room (bunk beds) and is ideal for children and again has fantastic views. The 3 piece Shower room has wash hand basin and toilet. The Kitchen has a microwave, dishwasher, Fridge / Freezer, washing machine and a tumble drier are shared with the Hayloft in the adjacent boiler room. Other essentials such as glasses, crockery, cutlery and a corkscrew are also provided for your convenience. The Hayloft is more spacious because its walls are less thick than the 2ft deep walls on the ground floor! 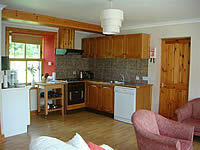 Accommodation comprises an open plan lounge with TV Video, CD Player and kitchen and dining areas. Double bedroom after a long day stretch out and relax, enjoy the peace and quiet, this bedroom has ample hanging, drawer space and fantastic views of the Glen. The Twin bedroom has more room than that of the Stables with ample hanging, drawer space and again fantastic views of the Glen. The shower room has a toilet, wash hand basin and shower cubicle. The Kitchen has a fridge, freezer, microwave, dishwasher. A washing machine and a tumble drier are shared with the Stables in the adjacent boiler room. Other essentials such as glasses, crockery, cutlery and a corkscrew are also provided for your convenience. 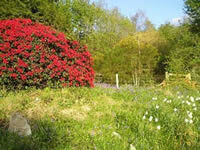 Outdoor there is a paved area outside with garden furniture and large gardens to relax in. On the other side of the burn there is garden furniture and a paved (gas) barbecue area for use by the Stables, the Hayloft and the Haven. The Haven, Stables and Hayloft can also be let together as one cottage – known collectively as the Steadings! 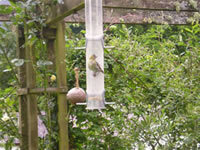 Pets, midge control, Cots & High chairs. There are also midge control machines in operation. A cot and high chair are available. Both properties are all non-smoking. ‘Well behaved and controlled dogs are welcome by arrangement. 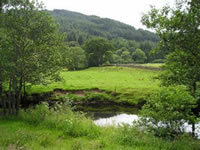 This is a rural glen and the surrounding fields may contain cattle and sheep, sometimes with young. Dog bedding should be provided by the guest. 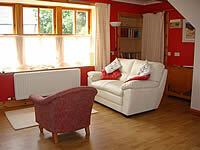 The Hire charges include all Towels, Bedding, Heating and Electricity. Pet Friendly – Yes well behaved pets are welcome by prior arrangement, a supplement is usually payable – please ask for details. For any help or assistance with this or any other enquiry please call 01729 851181, text’s to 07885 211787 – you will not find these Cottages listed anywhere else for any less.